WOh .it been almost 4-5 years since i last went back to my secondary school - geylang methodist secondary school.School have move to a temporary place near kallang bahru .This session was organised last min as i only know that today is teacher's day from yesterday. ANd thus only manage to get 2 ppl(huanjie and chee keong) to join me in this trip as most have morning class. MOst of my teacher is not there any more .except form teacher - Johnny joseph (who have change alot in the way he speak english and sound more local. Biology teacher - Miss lam (never spoken to her cos lack of time need to rush back to NUS for lecture).Chemistry teacher-Miss Ng (also didnt talk to her ) . 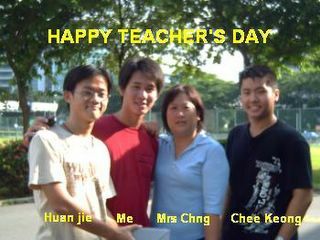 Chinese teacher -Mrs liao (also never talk to her ).Tour trip teacher -Mrs chng (talk to her about life in Nus )hehe came back mostly because of her as my sister(currently studying there) say she complain that i "wan en fu yi " and didnt visit her .hehe so now i am back there visiting .Prefect master when i left school - Mr CHua( haha he still remember i help him up in teacher day by modelling his clothes in the teacher day performance last time. Then rush to school for lecture after which go over to parent shop to bring my dad to see doctor .